The curse of knowledge is a psychological effect that greatly influences our professional and personal life. Negatively, in many cases… Among persons especially vulnerable to its results, we can list employees in charge of communication within the company — managers, marketers, PR persons, HR department as well as Employer Branding. What is this curse exactly? In 1990, a young student in psychology created a simple game in which she divided the participants of the experiment into two groups. Members of the A group: they were asked to choose a well-known song, such as ‘Happy Birthday’. Then, they were told to rhythmically tap the song on a table. Having tapped the rhythm, they had to estimate how often the listeners from the B group would be able to guess the title of a given song. Members of the B group: they were asked to sit at the same table with the members of the A group and listen to the tapped songs. Their task was to figure out the title. The tappers from the A group were 50% certain that the group B would be able to identify the song they had had in mind while tapping. In reality, study results were completely different from their estimations. Only 2.5% of the guesses done by the listeners from the B group were correct. In other words, the listeners were able to figure out the song every forty cases, and not in every second case, as the tappers had believed. At first, the researchers thought that these results might relate to a conviction of listeners regarding their fantastic ability to recreate music. Therefore, a new version of the same exercise was implemented. During the experiment, a group of independent observers were told the title of a given song and asked to predict the probability of the correct guess from the side of the ‘listeners’. It turned out that the observers estimated the chances of listeners to figure out the title at 50% as well. * As these elements would probably come into your head when you think about the ‘Final Countdown’ song. Which is why the tappers and observers were so surprised once they realized that the B group members were unable to guess the title. They couldn’t see the problem from the perspective of the listeners, who heard only an erratic tapping. 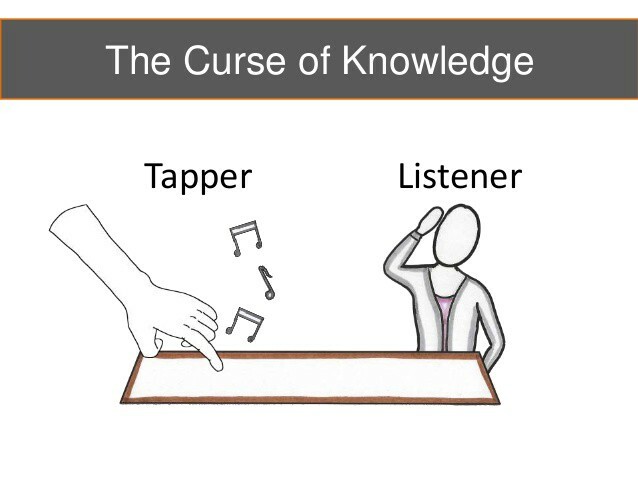 For this specific reason, we call the described phenomenon the curse of knowledge. When information or knowledge related to a specific topic is easily accessible to us, we may have an erroneous impression that the same happens with other people. Sometimes it concerns banal things like a title of hummed song, yet the consequences are rather serious — we get the feeling that someone fails to note our bad mood; a salesman besieges us with professional terms that we do not understand; employees do not have the slightest idea about the company’s strategy. Because of the curse of knowledge, we unconsciously assume that our audience is in possession of the same large amount of information regarding a given subject as we are. This misconception may lead to many misunderstandings and conflicts. Within companies, the curse of knowledge manifests itself in the process of the internal communication between departments and in relations between managers and employees. What is the point of explaining things since they are obvious? By such thinking, we tend to forget about providing our interlocutor with useful information. As a consequence, our recipient does not have a clear picture of the situation since he or she may not have the same knowledge as we have, thus he/she is not convinced of our idea, product or solution. We can hear the whole melody in our head while they are doomed to get only some irregular tapping. Still, we are not completely defenceless towards this effect. Some interesting methods to evade the curse of knowledge inside the organization are described by Chip Heath — a professor from Stanford Graduate School of Business. In his article published in Harvard Business Review,  he illustrates how ‘translating’ the company’s strategy into particular examples helps to implement it more efficiently. Thanks to this method, employees are able to better grasp the management’s guidelines and clients — the image of the brand. The first described case applies to the company Trader Joe’s — the American market leader in the field of organic and fresh food sales. The company’s mission is already more detailed and precise than the majority of corporate slogans as it says: ‘to bring our customers the best food and beverage values and the information to make an informed buying decision’. Unfortunately, this is not a type of statement to be easily imprinted in our mind. Hence, the company translated it into a more comprehensive language. Inside Trader Joe’s organization, it functions as the ‘Home of cheap thrills’ slogan, whereas the target customer is described as an ‘unemployed college professor who drives a very used Volvo’. Although this image is a simplification, as there are probably not many college professors who shop at Trader Joe’s, this kind of example better appeals to the imagination of the company’s employees. Definitely much better than the ‘male, 50–65 years old, higher education, salary up to $4000/month or no salary, in possession of a vehicle, interests: science, reading, fishing’. Thanks to the presented method, things that seem obvious to marketers become comprehensible to other employees as well. Although this example constitutes a significant simplification, for the majority of people from outside the field of marketing, this is sufficient. The transmitted information, examples & stories are like puzzles which are being used to visualize the concept. If we don’t give them in a proper way, the visualization won’t be complete. Another method to evade the curse of knowledge is to use stories. A great example of how to apply the storytelling method to sales may be provided by the FedEx case. FedEx sellers have probably many cases to share, but one of their stories is particularly appealing. New York, in the evening. A FedEx delivery truck moves through the city, delivering the last packages. Suddenly, the van stops, its engine broke down and doesn’t work anymore. A female driver quickly calls for the replacement, but it gets stuck in a traffic jam. The driver decides to cross several streets to deliver packages on foot; unfortunately, she feels that she would lack the time to deliver everything. Unexpectedly, she sees a competitor’s delivery truck passing nearby. She stops the car and persuades the other driver to take her to her last few locations. All packages are successfully delivered on time. This kind of story, told within two minutes, clearly shows clients what it means for FedEx to deliver packages. Often, this method is more efficient than dozens of tables and charts. In addition, the credibility is even more enhanced, thanks to the fact that FedEx organizes a contest in which the company honours employees — who uphold FedEx’s guarantee that packages will arrive overnight — with the famous Purple Promise Award. Stories are easily engraved in employees’ memory and become a part of company’s legends. They are also used to educate new couriers about the company’s values. To sum up… How can we remove the curse of knowledge and use the power of clear examples and stories in our communication? In order to do it efficiently, we have to take care of several key points. It would be beneficial to involve in this process persons from outside the field. If someone who does not know the topic is able to understand our concept, it will mean that we are on the right track. If, in addition, he or she were able to remember the most important parts, it would be even better. The best desired effect would be to truly fascinate him or her by our idea. However, it may be only possible when our audience can hear the whole melody instead of a remote tapping. Preparations quickly pay off in the form of a better understanding of the company’s strategy, a smoother communication within the team and better sales. Not to mention clients who, eventually, would understand our product and be as enthusiastic towards it as we are. In my work I evade the curse of knowledge everyday. The company I work in have already created over 140 explainer videos for the world’s biggest brands. Maciej Budkowski — a psychologist and marketer in ExplainVisually, responsible for marketing and sales. During his studies at the University of Warsaw, he studied the influence of large amount on information on the level of processing. Then, he managed communications in IS-Wireless, a high-tech telecom company. He gave a lecture entitled “The use of visual thinking in building customer experience” at the Marketing Summit 2016. You can find some of his psychology-related articles on imprific.com. One of the biggest producer of whiteboard animation videos in Europe, it regularly works with the biggest brands in the world, NGOs, SMEs and start-ups. ExplainVisually services are provided to such organizations as: Carlsberg, UniCredit, Orange, Credit Agricole, Millennium Bank, Remondis, AmRest, ING, PARP, Pratt&Whitney, BZWBK (Santander Bank), Tesco and TEDx.